A graduate member of the Tomahawk High School Class of 1945 participating in football and basketball during his high school athletic career. 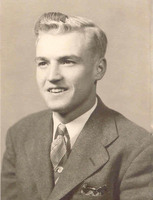 One of Rod;s high school highlights was being selected as Most Valuable Player of the 1944-45 basketball team where he led the team in Valley Conference scoring. Although there was no baseball at Tomahawk High School during his high school years, Rod enjoyed and excelled in that sport as well. He played for the Tomahawk Cubs, and he pitched for several minor league baseball teams including the Hiram Walkers and Bradley prep teams in Peoria, Illinois. Rod was the only player in Tomahawk history to play major league baseball. He was asked to tryout for the Milwaukee Braves and Cincinnati Reds, but he signed professional baseball contracts with the St. Louis Browns and Philadelphia Phillies. What is even more amazing about Rod's baseball skills was that although he was right-handed, he had to switch to left-handed. This was because in his youth, he fell out of a haymow in the barn and broke his right arm. The break was poorly set and since that time, he could never straighten it out. Rod was active in the Tomahawk community. He was an usher and a long-time board member at St. Paul Lutheran Church. Rod loved sports and became a WIAA football and basketball official. Rod is also known for starting the girls' invitational softball tournament in Tomahawk. This annual event gave something back to the girls' softball program in the community. In addition, he was instrumental in expanding little league baseball in Tomahawk in the 1960s. After his wife passed away in 1960, Rod was a single parent and had to raise four small children ages 3, 6, 8, and 9. Rod was employed at Owens-Illinois/PCA for 43 years.